Captain Mike Rowell was born and raised in nearby Pensacola Florida. He has fished the northern Gulf of Mexico with his Father and Brother all of his life. He was a electrician for 11 years and fished on weekends, holidays, at night and any other time he could . As many other fisherman who cant seem to ever satisfy their appetite for fishing, Captain Mike dreamed about fishing full time. One day he came upon a fork in the road in his electrical career. Stay in the electrical business or pursue a dream of working on the water. He had virtually no money and one week of vacation. He took the chance and enrolled in a one week Captain’s course in Mobile, Al. He studied for his Coast Guard exam knowing this was the first step toward his dream. If he did not pass this exam in this one week of vacation he would have to go back to his electrical work. He stayed in Mobile that week so he could stay focused on his goal. He lived behind the chalkboard walls of his class room and slept on mattresses thrown on the floor. This was not the type of “dorm” that was portrayed in the brochure. He says he had never studied that hard in his life. At the end of the week he passed his exam in New Orleans, La. On his way home, he inquired about a job in the offshore oilfield. He was hired as a 2nd captain on a crew boat. He worked two weeks on and two weeks off. Even though he enjoyed running those big boats, he still wanted to pursue his dream. The two weeks he was off he would deckhand or run other peoples boats for them as a guide. 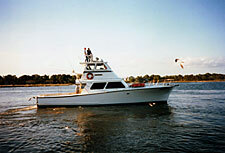 He began his career as a full time Charter Captain in 1989 at the helm of a 42 foot Bertram, “Low Bidder”. In 1993 the Low Bidder acquired a new owner. Captain Mike remained at the helm of that vessel, now known as the “Dunn Deal”. In 1996 Captain Mike was offered the position as Captain of the Charter Boat Outcast. The Outcast was a multi passenger vessel and this was a step in the direction that he wanted to go. In 1997 Captain Mike bought his own boat. “ The Intruder.” A 53 foot Harkers Island. His dream was now becoming a reality. Captain Mike has met many people from all walks of life during his career as a charter boat captain. He has made many new friends. One of the most important ones being his wife, Tammy Jackson. She shares the same passion for fishing as Captain Mike. She was instrumental in making his dream of owning his own boat come true. 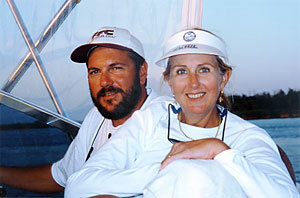 John and Anne Stokes are two other people that Captain Mike met early in his fishing career. They have become very close friends. One day on their ride home from a fishing trip, Captain Mike and John put together a plan and formed a partnership. And on March 21st, 2002, Captain Mike’s dream became a reality. Anne smashed a bottle of Champagne on the bow of a brand new 62 foot Resmondo and “The Annie Girl” touched the water for the first time. In Captain Mike’s opinion, there is not a better boat built for the type of fishing he does. Captain Mike says that he is very fortunate. He could not be where he is today without the help, support and encouragement of his family, friends and mentors. He is very thankful for them.